What do you do when your cell bank strains produce inconsistent results? MicroPyles Case No. 4. Recently, one of our customers sent us their cell bank strains for characterization using our Ribotyping service. Well, as luck would have it, things did not go as planned and they ended up facing what every manufacturer dreads: an unexpected slowdown in production. Before we go into details of this incident, let’s briefly discuss the significance of cell banking in a production facility. The cell banking system typically consists of a master cell bank (MCB) and working cell bank (WCB). The MCB, produced in accordance with federal regulatory “Guidance for Industry” or “Points to Consider” documents, is usually obtained from a qualified source and has an associated, well-documented history. The WCB is produced or derived by expanding one or more vials of the MCB. The WCB eventually becomes the source cells for every batch in production. The cell banking system contributes greatly to the consistency and quality of the product. Therefore, the authenticity and purity of the cell bank are very critical to cell and gene therapy products so a reliable testing program targeted to the type of cell bank is an essential requirement. Coming back to the customer’s story, two samples were sent for testing – one MCB and another WCB — for characterization with our fragment-based typing service. We conducted the test as requested; unfortunately their cell bank strains failed to produce consistent results with the service the client requested. Initial submission of MCB and WCB samples failed due to poor resolution of the DNA fragments. The customer resubmitted the samples and in the second run, only the MCB sample produced banding patterns with both the restriction enzymes (EcoRI and PvuII) while the WCB sample failed to cut with PvuII and only generated the EcoRI banding pattern. (Click here for image.) The assay was repeated twice, but the same results were obtained. The customer was naturally concerned by these results since this was their production strain. The result was confusing because both these samples came from the same clone, but the data lacked support for this claim. The customer resubmitted the samples to rule out possible sample preparation error; unfortunately the results did not change. In short, weeks of waiting resulted in no resolution. This characterization crisis could now lead to a production hold. The customer reached out to us for help, and we offered to work to resolve this situation by offering an alternative characterization service – one based on sequencing. At the time we did not have a multi-locus sequence-typing (MLST) assay developed for this microbe in question, so we expedited our MLST development efforts for this organism so that the customer could avail themselves with this service as a valid method. 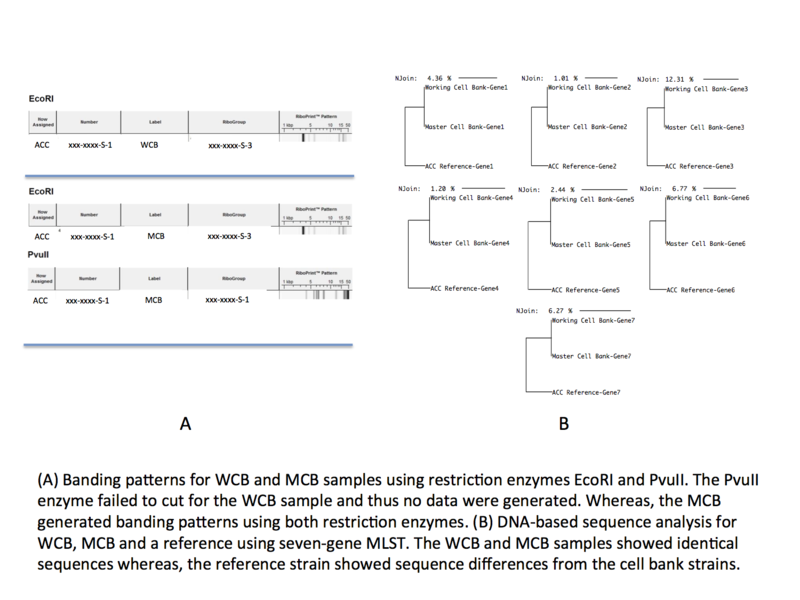 Significantly, the result from the MLST analysis was very comforting to the customer because both MCB and WCB samples (see Fig 1B) came back indistinguishable after sequencing seven gene targets. MLST is widely accepted as a better tool for microbial characterization than the fragment based methods, so this outcome was not surprising. Even better, we could offer this service to the customer on the same day we received the samples, avoiding any further delay with production.